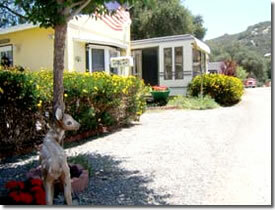 Ortega Oaks RV Park & Campground is located in the beautiful, ancient oaks of the Cleveland National Forest and San Mateo Wilderness Area of California. Our 35 acre park offers spacious RV sites with F/U and dry tent camping; individual to large group sites. The group camping sites are perfect for Boy Scouts, church functions, weddings parties or family reunions. We also offer delightful 1-bedroom park models with outdoor sundecks and an abundance of windows, all settled in the national forest. Once you are at our property, we offer direct access to miles of hiking and equestrian trails. You can also play a game of billiards and watch movies in our clubhouse by our stone fireplace, or you can check your emails by using our complimentary Wi-Fi access. All this provides for a unique experience in southern California, nestled in the mountains yet close to cities and many area attractions.